Capybaras, also known as capibaras,have heavy, barrel-shaped bodies and short heads with reddish-brown fur on the upper part of their body that turns yellowish-brown underneath. They are shy and associate in groups along the banks of lakes and rivers. They swim and dive readily and commonly enter water to elude predators. Capybara san are very popular in Japan. They relieve me a lot. 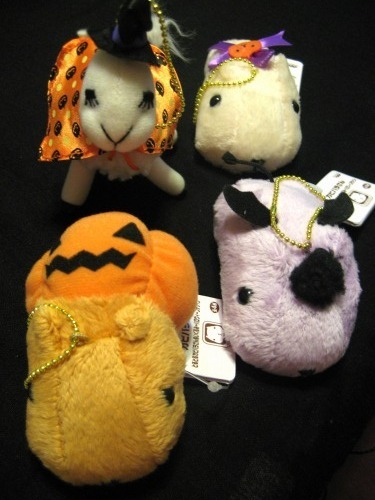 These are Capybara san which I got form a Claw Crane (also called a UFO Catcher). They wear Halloween Costumes. Sooo cute!! Happy Halloween!! 2 : Halloween is coming to poupeegirl! here in Tokyo real world (LOL! 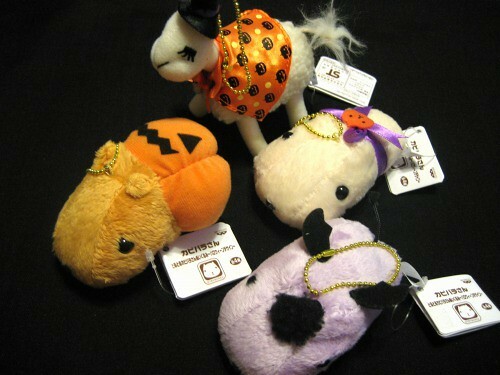 ), we also can get tons of Halloween goods. 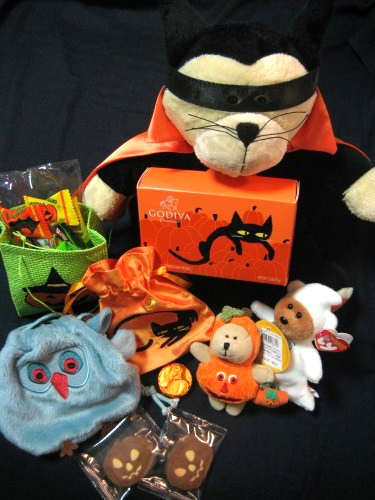 The bear which costumed in fetching feline attire and a drawstring bag of black cat are from GODIVA Chocolatier. The 77th edition Bearista Halloween Pumpkin Bear is form STARBUCKS. Have you seen Hello Kitty’s side view ? New profucts of Hello Kitty’s side view are released now in Japan. 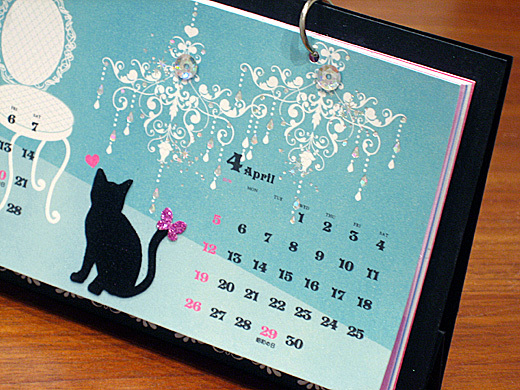 These series are called “Silhouette Kitty”. Hello Kitty’s designer, Yuko Yamaguchi designed with affected by Audry Hepburn’s side view. It’s first time to show her side view. Is it the Renaissance of Hello Kitty ? Bags, mug, plastic case, hand mirror are selling. 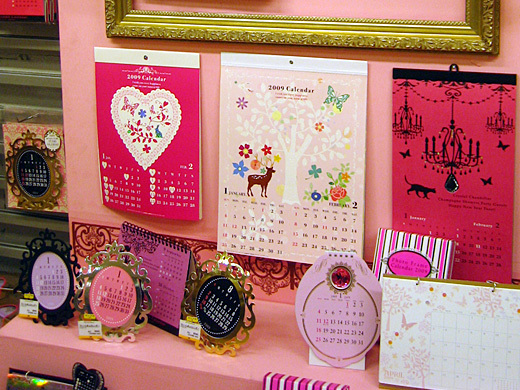 Now in Tokyo, we can select hundreds of calendars at Loft, Tokyu Hands, or else! 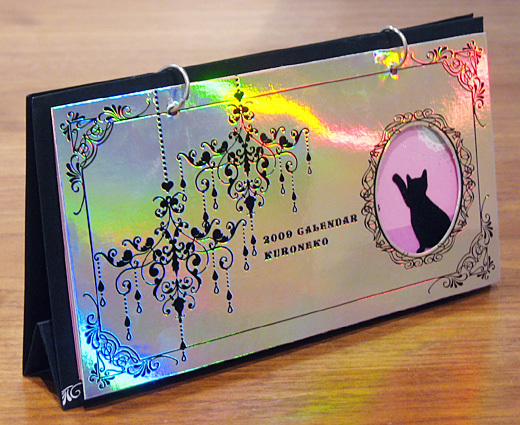 I got princess-like cat’s one, decorated by shine papers, paper cutouts, rhinestones, spangles, and thin felts. I hope 2009 become a beautiful year like this! 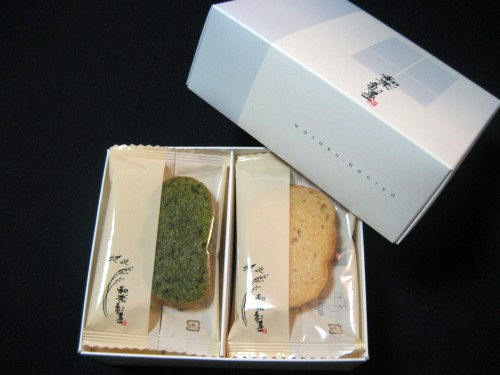 A rusk is a rectangular, hard, dry biscuit or a twice-baked bread. 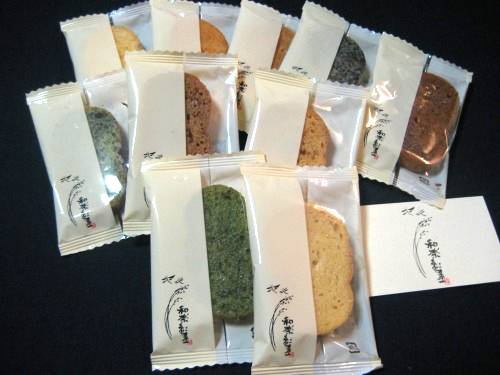 There are miso (bean paste), Soybean Flour, soy sauce, brown sugar, sesame, yuzu (citron) flavors from Waraku Beniya. They are very tasty. 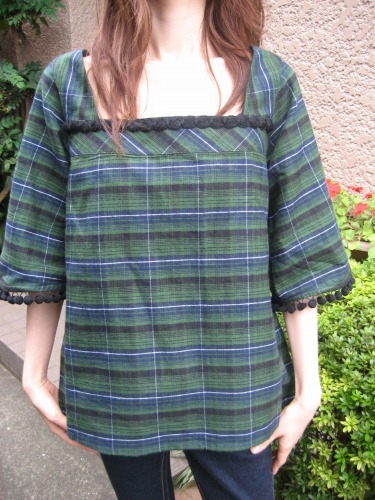 I got a cute Plaid PomPom Tunic from Milk Fed. Plaid is one of the hot trends for fall,and you can see that plaid is everywhere in Tokyo. we (especially Takako! 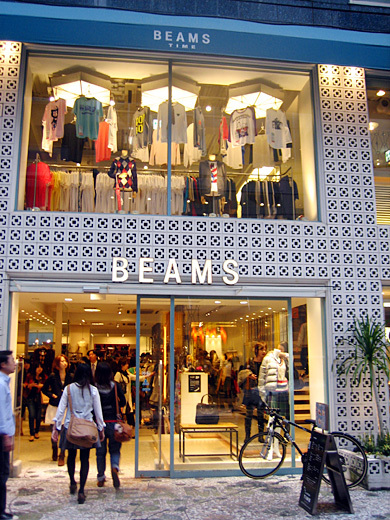 ;)) reported products bought at BEAMS sometimes. 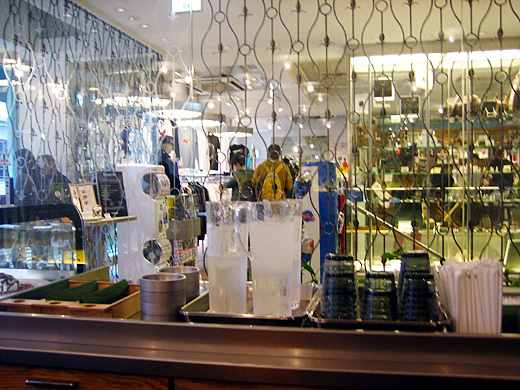 BEAMS company also produce a café in Shibuya shop. 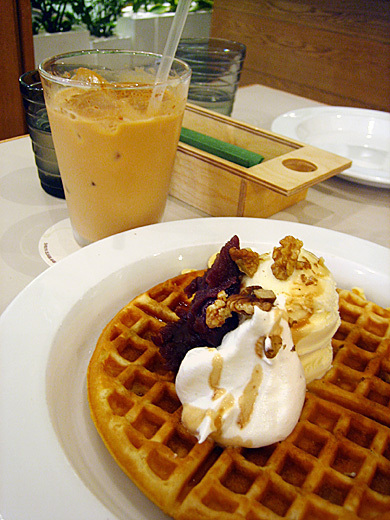 we can have some sweets or sandwiches. 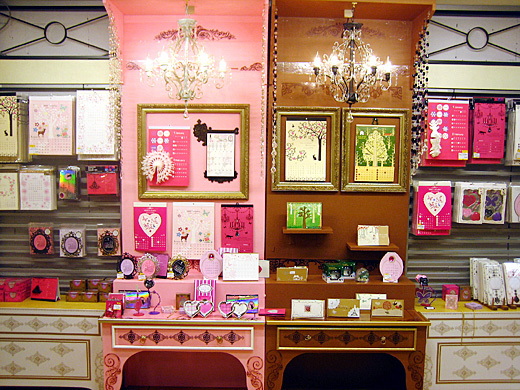 You can enjoy tea time watching many T-shirts or cool products.